It's a wonderful track, a perfect pop song. I know people were sick of it and Raspberry Beret at 90% of the shows but the few times I caught Prince live it was a total highlight based just on how much the crowd loved it. Sonically it's maybe a bit ahead of the rest of the Purple Rain album but he was always dropping those hints, whether consciously or not, on where he was going next wasn't he? It has a lightness of touch that side one of Purple Rain needed. I love it, I think it fits perfectly on the album and in the movie. Agreed, Apollonia is not a great singer, but Prince more than makes up for it. One memory I have of the song: I was playing the album at work one day, and my coworker/friend who is a drummer heard the intro to Take Me With U and his ears perked up. He kept hitting starting the song over to try to figure out just how it was done. I love this song too. The weird thing is that Apolliana's pitchy vocals add to the wonderful casual and breezy element to the song. I also think that the song is irresistible as a sing along. If Apolliana can do it, then so should I with no embarrassment. Appollonia’s vocals are just fine for the song. I remember most reviews reported them as indistinct, almost buried, indistinguishable from Prince Rogers Nelson’s so complaints about her vocals seem daft. 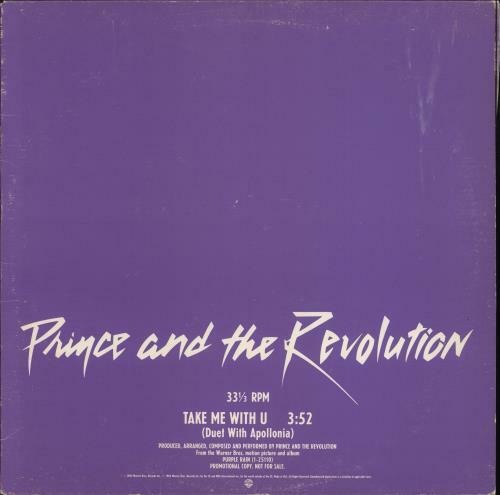 Today in 1984, Prince recorded this gem. Really a gorgeous, sugary-sweet little song, especially with the unedited ending. I feel it's quite underrated. Thoughts? UNedited Version shoulda been a 12"!! With a B-Side!!! It's my most-played Prince song on last.fm. So I love it, obviously. A little sugary by Prince standards, but there's nothing wrong with a bit of sugar. Plus, I seem to be one of the few people who actually kinda like Apollonia's voice. I LIKE Apollonia's voice too. It's my favourite song on the Purple Rain album. It has such an uplifting vibe to it. I was one who had to listen to the song a few times before I knew which lines Appollonia was singing. In fact, the first few times I heard it I thought, "Duet? No one's singing but Prince!" Prince has some AWESOME harmonies buried deep in the mix, too. Especially on the last verse. "As fine as she is she don't haveta sing!". I think I hear Lisa helping too. Things came to a head on January 28, following the American Music Awards in Los Angeles, at which Prince was nominated for ten awards (Sheila E. had two nominations, and the Time picked up one, as well). 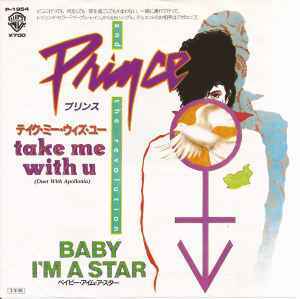 A few days earlier, “Take Me with U” had been released as a single, the final single from Purple Rain; it was also the only one with another track from the album, an edit of “Baby I’m a Star,” as the B-side, and the only one to fall short of the Top Ten, peaking at number 25. "Apollonia was not a singer," explained Lisa Coleman. "She was an actress. So the poor thing was thrown into the studio: 'Here, you have to sing this.' She was like, 'Oh my God, I don't know how to sing.' And she did the best she could. I doubled her vocals on 'Take Me With U' to make it sound a little better." Jill Jones was also recruited to help by providing a ghost track for Apollonia to follow. "It wasn't ever to take anything away from her," said Jones. "It was just to strengthen her so she would come back and approach the studio differently. I believe that's how he felt about it, because we saw a difference. Like, 'Oh, wow, she's getting there.' And it made for better performances in the studio, and he could discover their style." After spending seven hours getting the vocal overdubs right on Jan. 30, and five more perfecting the final mix the next day, Prince sequenced the song as the opening track on the proposed Apollonia 6 album. 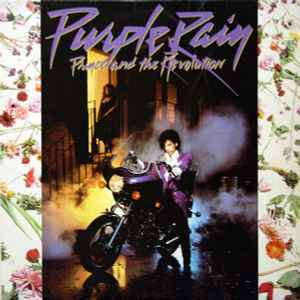 However, on April 14, he decided to move it over to the Purple Rain soundtrack. It's an OK song...not great,but OK.....probably my least favorite track on the album. Why must we play this game? It's the weakest track on Purple Rain. And Apples could not sing that song. That's why the live version with The Revolution, and Wendy and Lisa singing her part, is a thousand times better than the recorded version. I don't think Vanity singing it would have been much better, as she did not have a very strong voice either. The best versions of this song are during the PR concerts. I still get goosebumps when I watch the Syracuse performace of that song. They start the song, the house lights come up on the first few notes, and the crowd goes ballistic - you can barely hear the band. It's simply awesome. Lisa Coleman has stated when they played that song she would have "audio distortion" because the crowd screaming was so loud - like "Beatle-mania". COLEMAN Apollonia came and saved the day. But she was not a singer. She was an actress. So the poor thing was thrown into the studio: “Here, you have to sing this.” She was like, “Oh my God, I don’t know how to sing.” And she did the best she could. I doubled her vocals on “Take Me With U” to make it sound a little better. KOTERO I don’t remember that. But I would imagine she’s on [the song].Much of the Purple Rain soundtrack was recorded over the summer of 1983 at a warehouse in suburban Minneapolis and live onstage at First Avenue. Always one of my favories. Pure pop genius. And it was not the worst song on Purple Rain because there is no such thing. It was fantastic live, especially with The Revolution. A great upbeat pop song and crowd favorite. ya know,Prince could have easily just recorded the song with Jill Jones (someone who can sing) and it would have worked out perfectly. OR.......Brenda Bennett!! They were His 2 PUREST Singers B4 Boni Boyer or Rosie Gaines!! Except they weren't the one ridin on the motocycle or on the album cover. Oh, and Brenda should've had a solo record!!!!!!!!!!! !